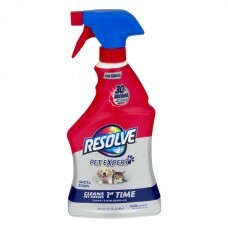 Resolve® Pet Expert Carpet Stain Remover. New formula. 30 Second action. Spot & stain. Cleans pet messes-1st time. 22 fl oz. (1 pt. 6 fl. oz.) 650 ml. RB - Health. Hygiene. Home. #1 Carpet cleaning brand†. Permanently removes the toughest pet stains like urine, vomit, feces, and tracked-in mud. Powerful odor stop™ technology: Eliminates pet odors - Freshens with a light, clean scent - Discourages pet resoiling. Safe for pets and children when used as directed. Tomato sauce. Vegetable oil. Food grease. Mud. Tea. Salad dressing. Make-up. Pet stains. Dirt. Grass. Dirty motor oil. Red wine. Coffee. Cola. Fruit juice. Contains no phosphorus. †Based on Nielsen data. Questions? Call: 1-800-2248-4722. For ingredient information, Visit: www.powerofresolve.com. © 2017 RB. How to Use: Open. Remove dirt. Spray - max 5 min. Blot. Before Cleaning: Test a hidden section of carpet for colorfastness. Allow test area to dry completely and observe for any color change. Remove loose dirt and blot wet soils with a clean absorbent cloth. Directions For Use: 1. Spray area with Resolve. 2. Wait five minutes. 3. Blot or rub gently with a clean, damp, colorfast cloth or sponge. 4. Rinse sponge or cloth and repeat as necessary. For Best Results: Treat stains immediately. Set in stains can be more difficult to remove. If last portion of product is difficult to dispense, turn trigger 180° to face opposite direction.